Diverticula can be found in various organs, in particular in the colon, but also in the duodenum or ileum, and in the esophagus. Every medical student should internalize the differences between true and pseudo-diverticula. Zenker's diverticulum, in particular, is often quizzed in exams. Are you more of a visual learner? Check out our online video lectures and start your gastrenterology course now for free! Diverticula are wall protrusions of hollow organs, whereby a distinction has to be made between “true” and “false” diverticula. It pays to learn the definitions, as they usually come up in exams. In case of a true diverticulum, all wall layers are affected, even the muscularis. The protrusion often arises through tension from outside, in the course of scarred or inflammatory changes that can be found e.g. with tuberculosis or lymphadenitis. In this case, only mucosa and submucosa evert to the outside through a weak spot in the muscle layer. The reason for this is increased intraluminal pressure. They correspond to the above-mentioned “true diverticula” and are usually found on the level of tracheal bifurcation. They are therefore also referred to as bifurcation diverticula or para-bronchial diverticula. Laimer triangle (= longitudinal muscle-free zone on the upper esophagus). Killian triangle (= muscle weak area between Pars obliqua and Pars fundiformis of the cricopharyngeal muscle of the dorsal hypopharynx): Strictly speaking, this is really a diverticulum of the hypopharynx, although it is usually dealt with in context with the esophagus. Diverticula in the area of the Killian triangle are also known as Zenker’s diverticula. Above the diaphragm: This is called an epiphrenic diverticulum. Zenker’s diverticulum is the most common representative with 70% and mainly affects older men, followed by the traction diverticula with 20% and epiphrenic diverticula with 10%. Especially large diverticula bring on complaints. Patients complain of dysphagia, retrosternal pain, feeling of pressure and nightly regurgitation of undigested food residues. The latter is connected to risks of aspiration and pneumonia. Deposition of food residues in the bulges leads to fetid halitosis. Some patients describe a “gurgling” sound while drinking. Diverticula rarely become inflamed, bleed, perforate or form fistulas. Note: Small diverticula, especially epiphrenic and para-bronchial diverticula often remain asymptomatic and are incidental findings in the course of i.e. x-rays. The diagnostic method of choice is an esophageal bolus swallow test. Due to the possible presence of a perforation, it is recommended to use a water-soluble contrast medium, as there’s a risk of mediastinitis or peritonitis upon exit from the esophagus when using barium. X-ray images most often clearly show the accumulation of a contrast agent in the protuberances, and allow a precise differentiation of the diverticula according to their location. Traction diverticula usually feature “ear-like” outgrowths, while pulsion diverticula are mainly sack-shaped. In order to be able to exclude other causes for the symptoms (carcinoma? ), an endoscopy should always be carried out as well. However, care must be taken as the mucous membrane in the area of diverticula wall is particularly prone to perforation. In terms of differential diagnosis, one should particularly consider esophageal carcinoma! Diverticula can be treated surgically. However, this is only indicated for Zenker’s diverticula and rarely for larger and symptomatic epiphrenic diverticula. Note: Traction diverticula and epiphrenic diverticula usually require no treatment! In the case of Zenker’s diverticula, however, there is always a surgical indication. The operation can be carried out endoscopically or openly. The diverticulum is resected and, in addition, a myotomy of the cricopharyngeal muscle is carried out in Zenker’s diverticula in order to avoid a recurrence. The lethality is very low and the success rate is high (95%). Postoperative complications are recurrent paresis, mediastinitis or neck abscesses and saliva fistulas. The correct answers are located below the references. The Zenker’s diverticulum is an epiphrenic diverticulum. Para bronchial diverticula are among the pulsion diverticula. Traction diverticula are always false diverticula. An epiphrenic diverticulum is always a real diverticulum. A bifurcation diverticulum is a traction diverticulum. …is not as well represented as other diverticula with 20%. …is located in the area of the Laimer triangle in the upper esophagus. …shows a contrast agent-filled bulge in the area of the hypopharynx during the esophageal bolus swallow test. …is treated surgically only in rare cases. 3. Which statement about the pathogenesis of esophageal diverticula is true? In the case of a false diverticulum, all wall layers are affected by the protrusion. True diverticula are mostly a result of increased intraluminal pressure. In true diverticula, mucosa and submucosa evert through the muscle layer. Traction diverticula can result from a tuberculosis infection. In Fisichella, P. M. (2014). 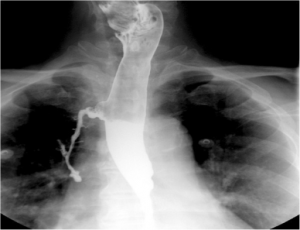 Esophageal diseases: Evaluation and treatment.